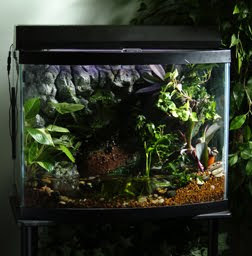 Keri T. shares an awesome tutorial on paludariums on the DFS pet blog - which are apparently terrariums with land and water features. Look pretty awesome to me! I'm sure those frogs love it. The word paludarium stems from the Latin words “paludal” (relating to marshes) and “arium” (a place of, or connected to). That is, an environment that combines both water and land. The real fun of a paludarium terrarium is showcasing a tiny, growing garden with living inhabitants, like fish or amphibians. I love this I have what we call a "bogarium" at our house. now I know the proper name. It has both low and high area's and water and land it supports a number of carnivorous plants , some moss , a very interesting slime mold , some forgotten aquarium snails and recently I introduced a colony of fruit flies (I have to keep restocking yet). I just recently saw some tiny little mushrooms as well in one corner. It's the most interesting 2x1 cube of wonder I have ever had the pleasure of owning. You inspired it by the way!! Some time ago. I never took the time to say thank you , so thank you much. Sounds awesome! I get so excited when a mushroom pops up in a container!